P N Ledeboer, C J Jones (now at the CH Museum, so he will know everyone). I'll think about the rest who were a few years above me. 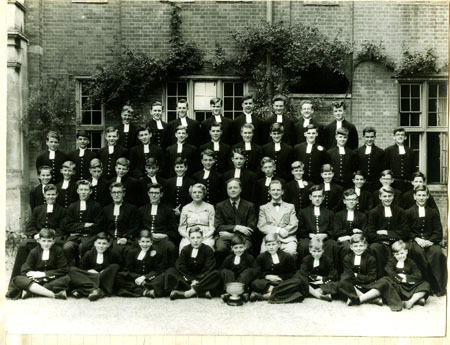 Third from left, front row, is Howard F. Williams, who was later transferred (briefly) to Thornton B. You may be sad to know that I have just received the obituary on Clive Perdue, middle of the front row. I had better own-up to having only just joined the forum. My user name 'horndub' relates to one of my hobbies, that of collecting Hornby Dublo trains, made by Meccano Ltd. between 1938 and 1964. Another hobby is running and maintaining a 1952 Riley 2Â½ litre saloon, with another, a 1Â½ litre saloon which I am working on, when I get time. After a working lifetime in laboratory work and quality assurance my business now is restoration of customers' Rileys, with two of them on the go at present. I shall probably not take on any more at this late stage as they can take up to five years, depending on the owners' preferred rate of expenditure. In the middle row between DN Ledeboer and MJ Lancefield is Jeremy Lea. In the front row is PS, (not PN) Ledeboer, and next to him is not Clifford Jones but Andrew Stillman who was tragically killed in a road accident in Kenya in the 1960s. Next to him is Howard Williams, and at the other end of the row between me and Iain Bremner are Michael Phelps and John Lee. John sadly passed away from natural causes in about 2003. In the front row middle is Michael Hillard, with whom I got on very well; I lost touch with him a long time ago, and would like to get back in touch if anyone knows where to find him. I recall he lived in the Oxshott area of Surrey. I owe you a beer in Bromley. Sounds like 'Tom Brown's Schooldays' to me ! Roger and Graham are probably contemporaries of JR, and were both at an Old Blues Day a few years ago. Of course, we never really used Christian names at school in our day. Faces are different. Sometimes when I look at house photo's on here, I'll see a face and a name will instantly come flooding back.